The Ducks look to defeat the Road Warriors for the ninth straight time today. Long Island comes in at 65-54 on the year, and 35-21 in the second half, two and a half games ahead of Somerset for first place in the Liberty Division, while the Road Warriors are 27-93, with a 10-47 second half record, seated at the bottom of the Liberty Division. This will be the final of 19 scheduled games between the two teams this season and their 127th all-time meeting. The Ducks have dominated the series, winning 103 of 126 games, and have a 12-6 lead over the visitors this season. The Ducks put up a 17-1 record against the Road Warriors in their last year of action, 2011. A couple of big homers led the Ducks to a 9-4 victory over the Road Warriors. The Road Warriors jumped out to a 3-0 lead in the second inning against Ducks starter Dennis O’Grady. RBI singles by Anthony Ray and Ermindo Escobar, along with a run-scoring fielding error, did the damage. Long Island responded with three runs of their own in the bottom of the inning off Road Warriors starter Kelvin Villa to tie the game. Following walks to David Washington and Dioner Navarro, Cody Puckett launched a two-out three-run home run to left field. One inning later, the Ducks would take a 7-3 lead with a four-spot. After walks to Lew Ford and Washington as well as an infield single by Miles Williams, Navarro lifted a two-out grand slam over the left field fence. A solo home run to left by Geraldo Valentin in the sixth closed the gap to three, but a run-scoring balk and an RBI infield single by Daniel Fields in the eighth pushed Long Island’s lead to 9-4. O’Grady picked up the win, tossing five innings, allowing three runs (two earned) on seven hits while striking out two. Villa suffered the loss, surrendering seven runs on six hits and five walks over seven innings with three strikeouts. Fernando Abad, Logan Ondrusek and Francisco Rodriguez each turned in a scoreless inning of relief for the Flock. Brett Marshall will start in a Ducks uniform for the second time today. The righty was brilliant in his team debut, lasting six innings and allowing just one run on four hits, striking out seven in a 6-2 victory. Marshall started his season with the Sugar Land Skeeters and Southern Maryland Blue Crabs, accumulating a 5-8 record with a 4.59 ERA with the two teams. The 28-year-old spent the first six seasons of his career in the New York Yankees organization, reaching the majors in 2013. Marshall collected a 4.50 ERA in three relief appearances with the Bronx Bombers, striking out seven batters. Julio DePaula starts for the Road Warriors today, making his 21st appearance of the season and first start. The righty has struggled recently, giving up five runs in his last one and one-third innings pitched over two appearances. DePaula is a seven-year ALPB veteran, representing the Bluefish, Revolution, and Skeeters in years past. The Dominican Republic native reached the majors in 2007 with the Minnesota Twins, making 16 appearances. TOP 1: Road Warriors strike first with three runs in the frame. BOT 1: Ducks come right back with three runs of their own to tie the game up! TOP 2: Road Warriors jump ahead with an RBI single to make it 4-3. TOP 6: A two-run double extends the lead for the Road Warriors to 7-3. FINAL: Ducks fall to the Road Warriors 7-3. The Long Island Ducks and Lancaster Barnstormers will close out their four-game series tonight. This will be the final of 17 scheduled meetings between the Ducks and Barnstormers this season and the 271st all-time meetings between the two teams. Lancaster leads the all-time series by just two games, 136-134, with the Barnstormers up 9-7 in the 2018 series. The Ducks bring a 30-17 second half record into the doubleheader leading the second half standings by four games. The Barnstormers are seven games back of the Sugar Land Skeeters in the second half standings with a 24-20 record, but they hold the first wild-card spot with a 62-45 overall record, three and a half games ahead of the Long Island Ducks. The Ducks’ split a single-admission doubleheader against the Barnstormers with a pair of very dramatic games. David Washington put the Ducks on top in the first inning of game one with an RBI single to right field. Lancaster responded with three runs in the second inning off Ducks starter Chris Pike. An RBI double by Ryan Casteel and a run-scoring fielder’s choice off the bat of Vladimir Frias highlighted the inning. 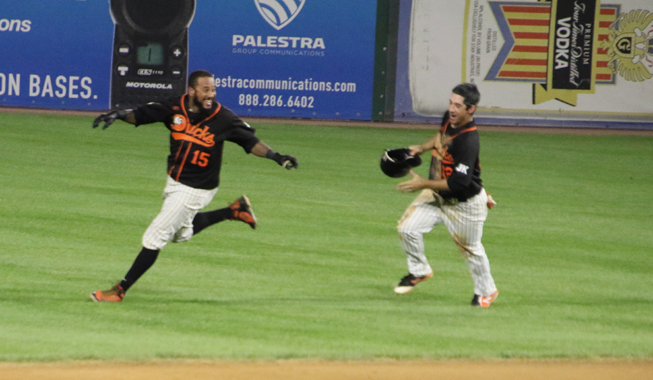 The Ducks came right back with a three-run bottom of the frame against Barnstormers starter Jonathan Albaladejo. A two-run home run to right by Jordany Valdespin and an RBI double to right by Lew Ford put the Flock back in front 4-3. 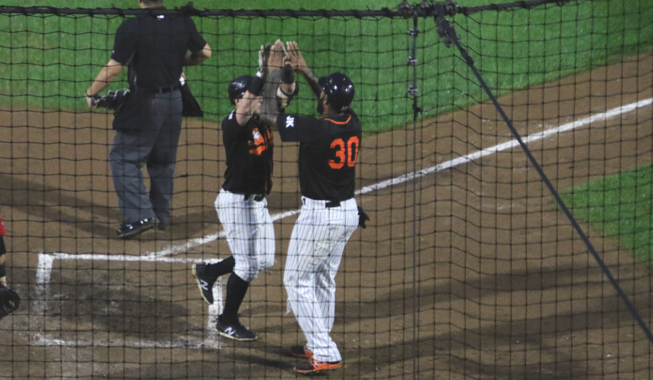 Lancaster tied the game in the fourth when Josh Bell scored on an error, but another RBI double by Ford in the bottom of the frame gave the Ducks a 5-4 advantage. One inning later, Washington scored on an error to extend the lead to two. It stayed that way until the top of the seventh inning when two walks were followed by a three-run homer to right off the bat of Bell, putting the ‘Stormers in front 7-6. However, Long Island rallied back in the bottom of the inning. Washington’s mammoth leadoff solo homer tied the game at seven, and following two singles and an intentional walk, Valdespin ended the game with a walk-off single through the left side. Neither starter factored into the decision. Pike pitched four innings, allowing four runs on five hits and three walks with one strikeout. Albaladejo lasted six innings, yielding six runs (five earned) on 11 hits and two walks while striking out four. Jose Cuas picked up the win after recording the final two outs in the seventh. Kaleb Fleck took the loss, conceding two runs on three hits and a walk in one-third of an inning. The Barnstormers jumped out to a 2-0 lead in the first inning of game two on a two-out, two-run single by K.C. Hobson off Ducks starter Lorenzo Barcelo. The Ducks closed the gap to one in the bottom of the inning on a solo home run to right field by Miles Williams off Lancaster starter Ty’Relle Harris. Travyon Robinson’s solo homer to right in the third restored Lancaster’s two-run lead at 3-1. A run-scoring groundout from Darian Sandford and an RBI single by Robinson in the fourth pushed the advantage to four. Cody Puckett’s solo homer to left-center in the fifth and a sac fly to center from Washington in the sixth closed the gap to 5-3. The Ducks then rallied once again in the bottom of the seventh, as Williams’ two-out, two-run single to center tied the ballgame at five. Lancaster took the lead back for good though in the eighth on an RBI single to center by Blake Gailen and a run-scoring fielder’s choice off the bat of Robinson. Neither starter factored into the decision. Barcelo pitched four innings, yielding five runs (four earned) on eight hits and three walks with two strikeouts. Harris lasted five and one-third innings, giving up three runs on three hits while striking out six. Huascar Brazoban picked up the win after tossing one and one-third scoreless innings of relief. Cuas took the loss, surrendering two runs on two hits and two walks in one inning. Left-hander Hector Silvestre will start the series finale for the Ducks. The Dominican Republic native is 2-0 with a 6.23 ERA through seven appearances (six starts) this season. The 25-year-old earned his second straight victory in his last start, giving up four runs on 10 hits to the Road Warriors in a 6-4 win. John Anderson starts the finale for the Barnstormers, making his 10th start and 32nd appearance of 2018. The second-year Barnstormer is 4-2 this season with a 3.01 ERA. He has been excellent lately, allowing just three runs in his last three starts. Anderson allowed two runs on five hits and a walk and added six strikeouts in his last start, a victory over the York Revolution on August 23rd. The lefty pitched in the Blue Jays organization for the first eight seasons of his career. TOP 2: A couple of errors in the infield lead to a 2-0 Barnstormers lead. BOT 3: Ducks cut into the lead after an RBI double by Taylor Ard! Ducks trail 2-1. TOP 4: Four runs come in after a two-out error to push the score to 6-1 Barnstormers. BOT 4: A wild pitch brings in a run for the Ducks! Long Island trails 6-2. BOT 6: The Ducks rally for four runs in the frame after two-run singles by Daniel Fields and Jordany Valdespin! Ducks down three, it’s 9-6. BOT 8: Taylor Ard CRUSHES a two-run homer over the scoreboard! Ducks are only down by one after scoring six unanswered! It’s 9-8 Barnstormers. FINAL: The comeback falls short, as the Barnstormers take the finale 9-8.